The tight institutional mortgage qualification standards create opportunities for private lenders. Lenders wanting to enjoy the security that comes with real estate backed loans may want to consider hard money lending that typically comes with a 25% to 30% loan to value buffer. Individual lenders can go it alone by performing a thorough due diligence on each transaction and then following up throughout the life of the loan or lenders may prefer partnering with well-established and experienced hard lender businesses such as Walnut Street Finance. 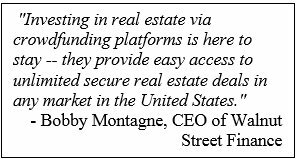 Walnut Street Finance CEO Robert “Bobby” Montagne is a real estate entrepreneur with three decades of experience in commercial and residential property development, finance, and sales. Having successfully overseen $15 billion in career transactions, he is fulfilling the entrepreneurial need for financing in the housing fix-to-flip and associated markets. This is a growing opportunity for private lenders that was created when large institutional lenders mostly backed away from the market as a result of the Dodd Frank Wall Street Reform and Consumer Protection Act. 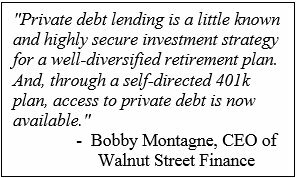 Investing a self-directed 401k or IRA in real estate loans doesn’t need to be an “all in” strategy. A conservative strategy limits your allocation to between 10% and 20% of your entire retirement account. Leaving you the freedom to diversify into other assets. There are also ways to invest in real estate without tapping retirement accounts. Crowdfunding has also gained traction as a source of financing for real estate entrepreneurs. Walnut Street Finance is in the process of organizing crowdfunding by drawing on its wide breadth of experience in the purchase, refinancing, and renovation of investment properties. Hard money lenders don’t use the standard underwriting process that banks use. Banks focus on the borrower’s credit history and income. Only after a borrower qualifies is the loan typically limited to 80% to 90% of the home value for a 30-year mortgage. Hard money lenders more or less turn this equation around to focus mostly on the value of the property. Additionally, hard money loans are typically only for 6 months to 2 years. Another significant difference involves the risk to reward equation. While banks are offering historically low interest rates, these are only for pristine white-picket fence homes. While not featured nearly as much in the mainstream media, the distressed property market remains alive and well today. This more profitable market has always been the primary focus of hard money lenders. Since the lender’s security is all in the property, hard money lenders use conservative valuation methods. While they will look at a professional appraisal, it’s not the only valuation tool that hard money lenders rely on because appraisals are geared toward bank loans. A hard money lender’s knowledge of the market needs to go beyond depending on the opinion of others. Especially when it comes to distressed properties that are the bread and butter for house flippers. Neither does the value a hard money lender places on a property have much to do with the purchase price that the investor negotiated. It is all about what the market values the property at. To fully protect themselves, hard money lenders typically only lend 70% to 75% of the value of the property. Also, keep in mind that a good hard money lender knows the fix and flip business as well as any investor. The investor/entrepreneur’s exact plan for the property is carefully considered along with the value of the property. Experienced lenders such as Walnut Street Finance fully vet each underlying real estate asset and borrower profile, allowing them to identify and fund only the best deals. As a result, private investors can confidently protect their capital while receiving attractive, risk-adjusted preferred returns on secure real estate loans. Most hard money portfolio loans range from $250,000 to $2.5 million. Investors in Walnut Street Finance Fund II have access to first-position, secured real estate loans that are underwritten and actively managed by the Walnut Street team. Please leave a comment about your private lending experiences or thoughts. Well said concerning the lack of necessity to go “all in” on self-directed IRA’s or solo 401(k)’s. Those are great tools, and if one is an expert in real estate or alternative asset investing, then “all in” might make sense. Otherwise, it makes sense to include alternative assets as a prudent part of one’s broader asset allocation. Well spoken Mr. Ellis. Self-directed IRA’s and solo 401(k)’s are alternative investment techniques to be explored with real estate being a leading strategy.